While perusing a new blog I found through Instagram the other day, I came across a gorgeous red lipstick (raise your hand if you’re not surprised) that had me stop and go, “What is she wearing? !” Turns out, it was Nicka K Hydro Lipstick, a brand from New York that I’d never heard of before, and the lipstick cost all of $4.99. Well, for that price, I didn’t think twice about ordering it to try out! I’m so pleased to finally open the popup shop that Rasha and I are hosting! All the dreamy Parisian-esque goodness can now be yours. The store will be open now through Sunday at midnight. I’ll post a reminder of the information every day. Find the goodies you want, buy them, and don’t forget the raffle code to get $25 off an order of $75 or more! AND DON’T FORGET THE FRIENDS AND FAMILY SALE! Use code: FRIEND for 25% off your order. K.I.S.S., or, Keep It Simple, Stupid. Those are words to live by. And that’s what Melt Cosmetics does. They do matte lipstick, they do it bright, and that’s all they do. I succumbed and ordered two of their colors a little while back (see, I told you I wasn’t as good as I should have been). I really love discovering new brands, and a brand specializing in matte lipsticks was right up my alley. My picks were Belladonna 2 and Shady Lady. Having them side by side, I kind of want to wear them together as a gradient! Belladonna 2 was part of my “Find the Perfect Red” initiative. From the product description, it seemed so promising. When they arrived, however, I had a little bit of a shock swatching Belladonna 2 on my hand. It looked pink. I showed it to Rose. She said it looked pink, too. It was worrying. At home, I put it on full force. Like, multiple layers. And finally, finally, finally, it was a gorgeous cherry red. Very bright, cherry red. 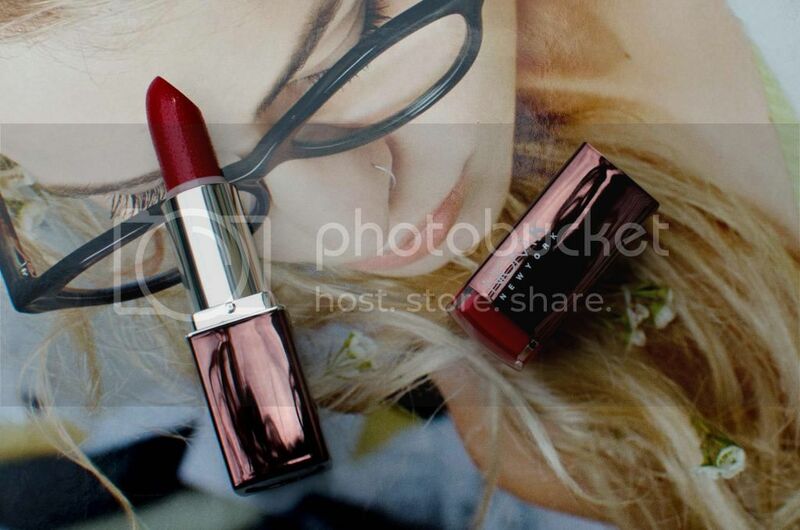 Definitely a gorgeous color—check out Keiko Lynn rocking it on her blog—but, sadly, not a contender for my perfect red. The real pleasant surprise, though, is Shady Lady. I bought it mostly on impulse. I was going to just get the red, but I have a weakness for fuchsia/magenta colors. (As revealed by my swatch book.) You could say that I’ve been looking for my perfect fuchsia as well, since I always buy them thinking they lean purple/violet, and then on me, they just look hot pink. First of all, when I swatched Shady Lady on my hand, even once I wiped it off, there was a stain there. It actually took me a couple of days to get it completely off! When I wore the lipstick for the whole day, it left an amazing stain on as well. But, in a good way. Like, at 5:00 in the afternoon, my coworker commented on how awesome my lipstick was—and I hadn’t reapplied all day! I was just wearing the remnants and the stain that was left. I’ve found my perfect fuchsia/magenta! If you couldn’t tell from that story, they wear amazingly well and long, stay matte, and feel good on your lips. The only thing about the lipsticks is they have a very strong smell/taste. I can’t even really identify what it is. It’s kind of vanilla mixed with wax mixed with something else. I’m sure some people like it, but I would have liked them better without it. But they’re still totally worth it. And, for Black Friday, they are offering 25% off! Just use code PAINTITBLACK. What do you think of the colors? Have you discovered any new brands lately? Are you going to get anything for Black Friday? need to live vicariously through you! Deal alert: Beauty bonus at Sephora! For all you beauty addicts out there, Sephora just debuted their “Beauty Fall,” a daily promotion where you receive a surprise bonus every day, whether it be 10% off, free shipping, or a deluxe sample. And the graphics are too, too adorable! It’s like a pop art Plinko from the Price Is Right! Play every day for a new bonus.